This recipe for stir fried asparagus is a wonderful side dish or vegetarian main course. The asparagus is paired with sesame oil and ginger and topped with crunchy chopped cashews. Heat the oils together in a wok or fry pan over medium high heat. Cook the ginger for 1 minute, stirring often. Add the asparagus and cook for 4 minutes, until barely tender and still bright green. Stir in the soy sauce and cashews and continue cooking for 2 more minutes to heat through. Makes 6 servings. Serve over rice or Chinese noodles. Sesame oil adds a wonderful savory flavor, but I find toasted sesame oil even better. The flavor goes a long way though, so don’t add too much. The 2 teaspoons called for in the recipe are plenty. If you need this recipe to be gluten free, make sure the soy sauce you are using is gluten free. This is a great vegetarian recipe but if you really want, you can add some chopped chicken to the recipe too. If you are using raw chicken, cook it with the ginger for a minute or two more. Remove it from the pan and add it back when you add the cashews. This is an extremely healthy recipe. Asparagus is very cleansing for our system and of course ginger is filled with nutritional benefits. This healthy stir fry recipe is also gluten free, quite low carb and a great diabetic recipe. 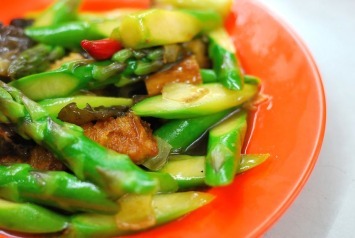 If you like this stir fried asparagus, you will find more Asian flavored recipes like it here.